You might not be familiar with Nonplayer right now, but if Legendary does it right, then everybody might know the name “Dana Stevens” in the future. 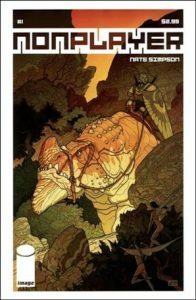 According to Deadline, Legendary has acquired the movie rights to the beautifully drawn comic book series by Nate Simpson and Image Comics. It has also tapped Eric Pearson, known for co-writing Thor: Ragnarok and the Agent Carter TV series, to write the script. Deadline describes Nonplayer as Guardians of the Galaxy meets The Matrix. It features Dana, who spends her free time playing as a high-ranking warrior in an augmented reality video game to escape the reality of her dead-end tamale delivery job, as its main protagonist. After she defeats a major character, though, the game’s AI goes out of control, and the virtual world starts merging with the real world. Simpson has only released two issues over the past six years so far, but the series already garnered critical acclaim. He even won an Eisner Award, which you could think of as the Oscar Awards for comics. Warner Bros. first optioned the title after its first issue was released in 2011, and a couple of Harry Potter and the Deathly Hallows producers were attached to the project. However, it never quite moved forward — hopefully, Legendary can finally bring the story to the big screen.